Our recommendation for celebrating a new beginning. Champagne’s traditional at New Year’s, of course, but sometimes it’s nice to go a couple of levels further. This is an easy and inexpensive cocktail to make, and scaling it up for guests is simple, since you can easily fit at least eight servings in a mixing glass. Kirsch (or Kirschwasser), a cherry-based liqueur, is reasonably cheap, and the raspberry syrup is inexpensive as well. It can be found in most grocery stores, usually near the maple syrup, and can also be ordered online. It’ll last a good long while after opening, too, but I recommend keeping it refrigerated. The original recipe that I found on CocktailDB is called Champagne Fraise and calls for a strawberry to be dropped in rather than a lemon peel, but strawberries aren’t in season, so that didn’t seem to make much sense to me. I went with homemade Asian citrus bitters and a lemon twist instead, and it worked very well. Oh, and as far as the sparkling wine goes … no need to bust out the Veuve, here. For mixing, I usually go with an inexpensive Prosecco or Cava, preferably something very dry like a brut. The other ingredients will bring plenty of sweetness. Combine kirsch, syrup and bitters in a pint glass over ice and stir thoroughly. 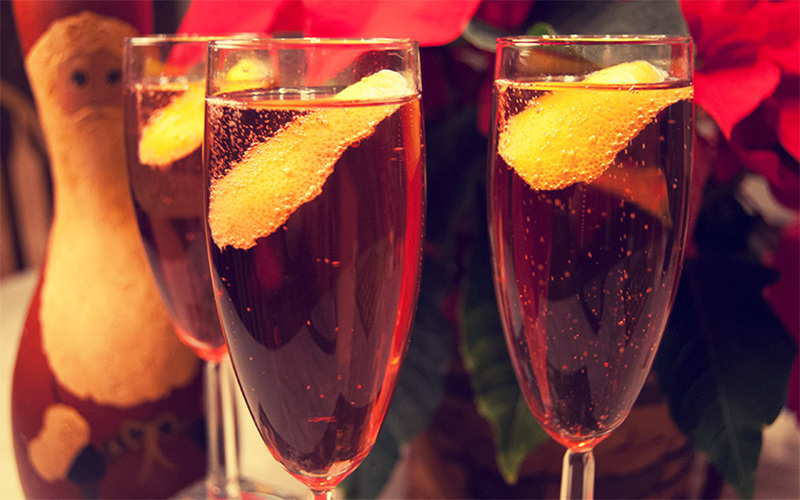 Strain into a chilled champagne coupe and top slowly with sparkling wine. Garnish with a lemon twist. Yep! The French have a whole host of “Royale” cocktails that involve various liqueurs added to sparkling wines. It’s pretty hard to go wrong with any of them, but I think this one offers a bit more complexity than the standard two-ingredient approach. Another interesting one includes the St Germains cocktail: 3 parts sparkling wine, 3 parts club soda, 2 parts st germains IIRC. Refreshing: tastes like grapefruit and honey sparkling wine, but not too sweet. Sounds tasty! Seems like a lot of liquid, but I guess the “parts” don’t have to be ounces. If you went with half-ounce parts you’d get a pretty standard-sized drink. Exactly– Although many liquor stores right now are selling St. Germains gift boxes with a pitcher specifically for this cocktail– Marking along the side dermark the point to pour each component. It is easy to mix up for a party– Although if two people like myself finish off a pitcher, I would certainly not recommend driving. Here’s a link to another version served with Ice.